Increase your client retention and rebooking by targeting clients who do not have any future booking. Send them a friendly reminder to pop back in to see you again. 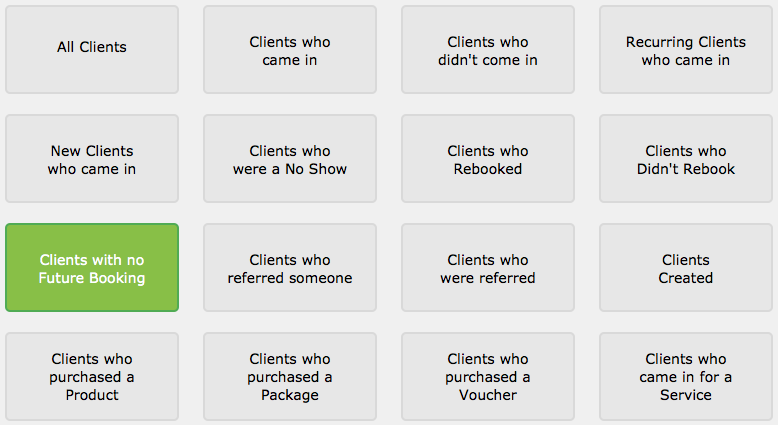 In your Marketing page, click the Clients Without Future Booking option. These are your clients who do not have any future bookings. Go ahead and send them all an SMS or Email. If you would like to target a specific Client Category, Gender or Referral type, use the drop down menus to filter the client list even further. Keep your clients from slipping away, and ensure they rebook as a result of your friendly promptings.